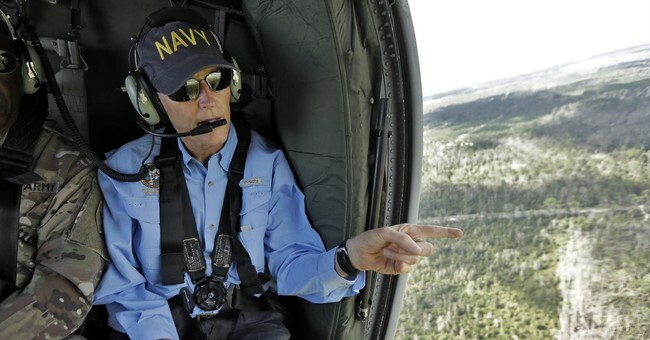 So Scott is supposedly "hiding from voters" because he correctly chose to step away from electoral politics to preside over a massive recovery effort, in the wake of a devastating hurricane that made landfall in the state he was elected to lead. This criticism is exactly as moronic and counter-productive as it looks. It's not the sort of critique that comes from a confident candidate, either. It seems quite possible that Team Nelson is seeing the same internals that Republicans are, in which Scott has pulled into a slight lead in this race. Desperate to claw back, Nelson is frustrated that his opponent's actual job currently requires him to devote his attention to helping the people of Florida deal with a disaster, thus making it more politically difficult to launch last-minute partisan attacks. How tragically inconvenient for Nelson, who apparently also can't comprehend that Rick Scott doesn't control the weather. She says she's terrified for her safety like many other victims because of this situation.